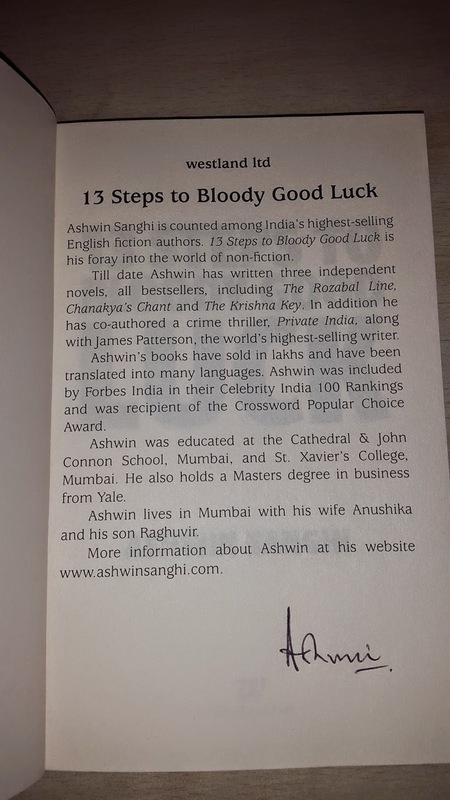 Luck as some says is a matter of luck but Ashwin Sanghi in this non-fiction book 13 Steps to Bloody Good Luck published by Westland Ltd believes that luck depends on one's attitude and approach in life and how he/she raise, recognize and respond in a particular situation. I have purchased this author signed copy from Amazon. I bought it for Ashwin Sanghi but since it is a non-fiction it took me about a month to start reading it as I am less interested in non-fictions but as I sat to read it I finished it in a single day. Cover : Cover design is attractive having three bodies without faces but having hands instead showing fingers which adds to 13. It is aptly design to attract the reader and I became interested in this book by looking at it's cover only. 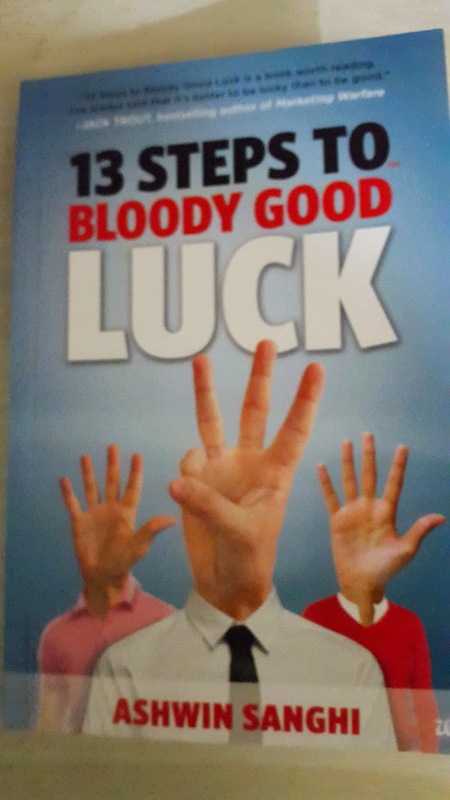 Content : The book contains 6 chapters explaining that luck depends on your attitude and approach in life and it is not something you are born with. Each one of us has capability to become lucky through these 13 Steps or as he called it by Causing Ripple. Causing Ripple is the mnemonic to remember these steps. C - Confidence, A - Alertness, U - Unlearn , S - Situations , I - Intuition , N - Network , G - Goodness , R - Risks , I - Information , P - Positivity , P - Passion , L - Leverage , E - Experiment. He has explained his theory with help of interesting anecdotes related to his own experiences as well as from experiences from the lives of some famous personalities in the world. Luck: This book tries to inculcate positive thinking in it's reader in which it is mostly successful. The small inspiring stories of famous personalities and about his own life make it a wonderful and interesting read. The simple language and the book's connection with the readers is maintained throughout which is why it is unputdownable. A small girl used to beg with her mother on Mumbai roads. A superstar known for his charity was among those who used to give her money. When her mother died she started begging herself it was then that superstar adopted her as his sister and gave him a new life. That superstar is Salman Khan and that girl is now known as Arpita Khan. Similarly we see many instances like a child surviving in Japan tsunami even after one week under debris, people coming out unhurt from fatal accidents or where actors' son getting films because of his father's success or owning a profitable family business where you need to stick to the basics. I think that some are born lucky which is not mentioned in book but some as Ashwin Sanghi says harvests luck with their various qualities but don't you think that one should be lucky enough to realize that he needs to harvest luck. Verdict : If you have restricted yourself to read non-fiction than this is the book you must pick to start reading this genre and have a positive approach in life. Rating : I would give it 4/5 stars to it.